The interannual variability of the East Asian upper-tropospheric westerly jet (EAJ) in summer is characterized by the meridional displacement of its axis, or a seesaw pattern of zonal wind anomalies between the northern and southern flanks of the EAJ. It plays a crucial role in summer climate anomalies in East Asia. 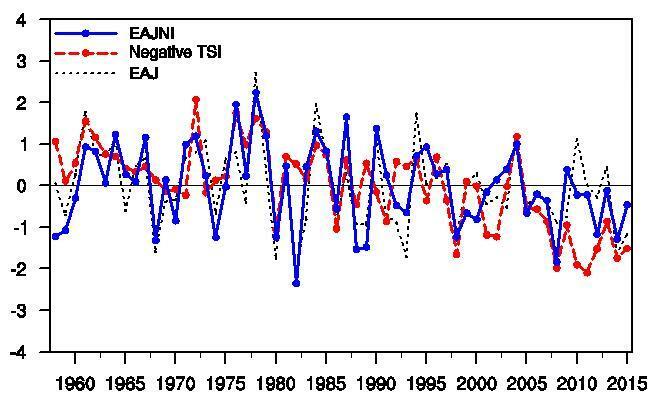 "Interannual variation of the meridional displacement of the EAJ relates to the tropical air-sea interaction, but mainly for the southern flank of EAJ," said LIN Xiaozhen, a master program student in the Institute of Atmospheric Physics (IAP) of the Chinese Academy of Sciences, and also the first author of a paper published in Atmospheric and Oceanic Science Letters. "We found a close relationship between the surface air temperature in the Russian Far East and the northern flank of the EAJ and revealed a positive feedback mechanism between them," she said. LIN's study indicated that related to a warmer surface in the Russian Far East, the westerly decelerates in the northern flank of the EAJ. The anticyclonic circulation anomaly related to a weakened westerly in the northern flank of the EAJ induced surface warming in the Russian Far East and the warmer surface could in turn act as a heat source and induce a local anticyclonic circulation anomaly in the upper troposphere, therefore decelerating the westerly in the northern flank of the EAJ. These results implied that a better description of the summer surface condition in the Russian Far East may benefit seasonal forecasts of the EAJ and, subsequently, East Asian summer climate.